Persistent Patient Prevails Against Insurance Company « Stacey Vitiello, M.D. This 49-year-old woman had cancer in her left breast a few years ago, and was treated with a left lumpectomy and radiation therapy. Worried that the cancer would come back and be found too late in her dense breasts, she’d heard about breast MRI in her survivors’ support group, and decided to ask her doctor to send her for one. Her doctor agreed, and gave her a prescription for the test. But her insurance company didn’t approve it, even though her doctor ordered it. The insurance clerk she spoke with after she was notified of the denial told her she didn’t need to have the MRI because she didn’t have a strong family history of breast cancer. But, she explained to the clerk, she’d had breast cancer herself– didn’t that count? The clerk told her that “a history of having had breast cancer yourself isn’t on our list of approved reasons for breast MRI. “ The patient was amazed. She then asked if her own mother and daughter would be approved for breast MRI since they both now had a family history of breast cancer (her! ), and the clerk said yes, that would be on the list of approved reasons. Our patient was furious. Who is at higher risk for breast cancer than someone whose body already had made one? There’s a lot of talk about “evidence-based medicine,” but how about using common sense as well? She decided to appeal the denial, and after many hours in phone-tree hell, and after emailing and writing to the insurance company over many weeks, with the assistance of her own doctor’s staff (they were paid for none of this time), she was ready to give up. She’d found a radiology practice within driving distance that performed breast MRI, read by fellowship-trained breast imaging doctors, and they would accept payment directly from her rather than from her insurer. It was expensive, but at this point she didn’t care. She was willing to forgo a few luxuries that year if it meant possibly finding an early cancer, and easing her fears of a recurrence. So, the patient had her MRI. 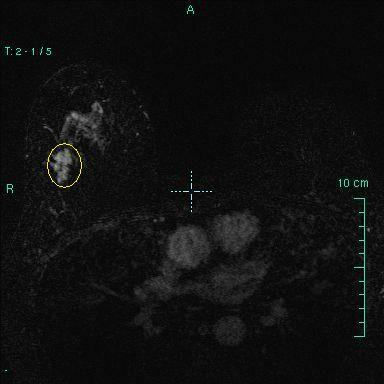 In the MRI image below, there is a suspicious 2.5cm mass in the right breast, circled in yellow. Remember that the patient had cancer in the LEFT breast a few years back, treated with lumpectomy and radiation. 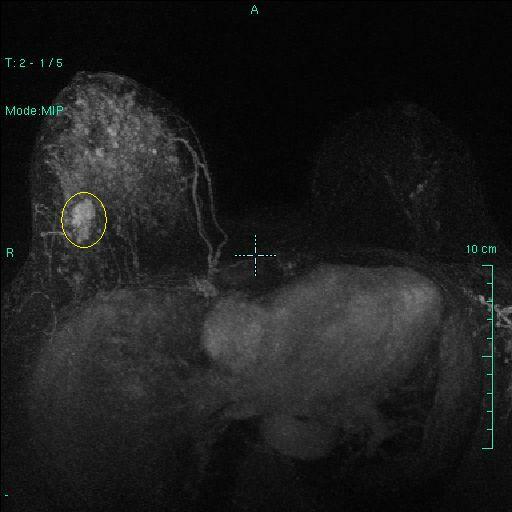 Because of the radiation, her left breast does not “light up” much on the MRI. However, the right breast, which had not been radiated, has a great deal of tissue that “lights up.” This is the dense tissue that makes her mammogram so difficult to read, and which hides up to half of breast cancers, including this one. Even so, the MRI clearly demonstrates the tumor. It was biopsied with a needle under ultrasound guidance, and the diagnosis was Ductal Carcinoma in Situ (stage 0 breast cancer, i.e. early detection). Take home lesson: pick your battles, and don’t give up. « How Do I Know If I’m High Risk? Really great advice. If anyone you know is facing treatment and having issues with insurance please let them know about LIVESTRONG Cancer Navigation Services. Visit http://www.livestrong.org/gabriel for more info.